Seeing how Bitcoin became popular in recent years, it’s no surprise to see many people attempting to break into this world and trade Bitcoin. Even though the bubble of 2017 – where Bitcoin reached a high of $17,500 – burst, the cryptocurrency market still remains attractive for both professionals and individuals. Because of the low barrier, global nature, and the opportunity to make profit, investors and speculators want in. If you have decided to be part of the cryptocurrency world and trade Bitcoin, you should go in with a solid plan and a keen knowledge on how to maximize your potential profit. You should take the time to familiarize yourself with the different cryptocurrencies, the trading platforms, as well as the applications you can take advantage of. 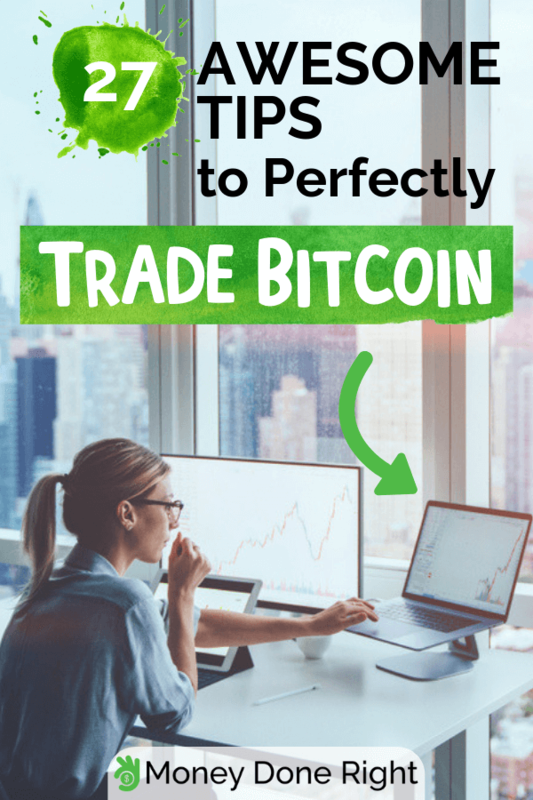 In this post, we are going to take a look at 27 ways you can trade Bitcoin successfully. Whether you’re a beginner in the Bitcoin world or a seasoned player, you are going to find useful tips and ideas on making more money with Bitcoin. Bitcoin is the most popular cryptocurrency around (often used interchangeably with that term) and the leading application of blockchain technology. The model introduced by Bitcoin is that of a peer-to-peer, decentralized, and secure alternative to traditional currencies that relies on public transaction records that are open for all to see and verify. As far as cryptocurrencies go, you can’t really go wrong with Bitcoin. As of mid-January 2019, one Bitcoin amounts to $3,594, making it the cryptocurrency with the highest value. Bitcoin Cash has been around only since August 2017, but it’s already attracting more and more users. The biggest difference that Bitcoin Cash brought to the table is the increase of the transaction block’s size from one Megabyte to eight Megabytes. Because of this significant upgrade (called “hard fork”), a much larger amount of transactions is made possible. You can either buy Bitcoin Cash from an exchange or convert Bitcoin that was in your possession prior to the August 1 hard fork, assuming it wasn’t kept on an exchange. And if you are a miner, you can receive it as compensation. Bitcoin Cash shows a lot of promise but you must be aware of its high volatility when trading it. As a new cryptocurrency, no one knows for sure if it will stay around in the long run – only time will tell if it will solve the scalability issue faced by the Bitcoin. Another great way to earn extra income online is to use SurveyJunkie. Sign up today and start making more money by taking surveys. Bitcoin Gold is another hard fork from the Bitcoin blockchain, and was launched in November 2017. It made Bitcoin mining more accessible to the everyman, since it relies on common GPUs instead of specialized ASICs (application-specific integrated circuit) devices. The idea behind Bitcoin Gold is to ensure more decentralization, fair distribution, replay protection, and transparency. Despite being younger than other cryptocurrencies, Bitcoin Gold is available to trade on multiple exchanges. While no one can say for sure if Bitcoin Gold will do well in the future, but it’s attracting more people and can gain value from the implementation of the Lightning Network, which allows near-instant payments and reduces transaction costs. Dash is another digital currency based on the Bitcoin software and worth considering as well. Dash added some notable improvements to the crypto formula, including faster transactions and better privacy. Plus, you can link it to either your PayPal account or any online wallet. So keep an eye on how Dash fares in the future to take advantage of trading opportunities. While it’s a well-known name in the cryptocurrency scenes, Ethereum is not a digital currency – it’s a platform. It’s the largest decentralized platform that allows developers to build Distributed Applications (dApps) and Smart Contracts, self-executing contracts working on if-then conditions and which can be witnessed by everyone. That said, tokens known as Ether (ETH) can be used as a cryptocurrency. You can find and trade Ether on many crypto exchanges. Looking for more ways to make money with Bitcoin this year? Check out this article. In terms of market and capital, Ripple is the third largest crypto platform behind Bitcoin and Ethereum. Note that Ripple is the name of the network, and the cryptocurrency is called Ripples (XRP). Ripple is similar to Bitcoin in terms of being open-source, anonymous, and free. The difference is that Ripple is more focused on B2B and faster at processing transactions than Bitcoin. Also, Ripple is owned by a private company that keeps centralized control over it, unlike Bitcoin and other cryptocurrencies, causing some investors to question its merits. That said, those optimistic about Ripple think it has chances of soaring in value in the future if it becomes the go-to crypto solution for banks, so stay in touch with it evolution. While not as widely known as the cryptocurrencies mentioned above, Litecoin is still popular in its own right. Created as cheaper alternative of Bitcoin – as its name indicates, Litecoin uses a different algorithm that makes mining more accessible and democratized. Litecoin also allows faster transactions, which is helpful for traders who make a lot of small transactions per day. Litecoin grew in popularity recently due to cryptocurrencies attracting a larger public and Coinbase starting to sell it. So while its worth is much less than Bitcoin, it’s more accessible and its value might rise in the future. EOS provides an infrastructure for developing decentralized applications, and comes with a token that has the same name. It boasts fast transactions and executions as well as a big potential for scalability. And unlike other cryptocurrencies, EOS does not charge transaction fees. However, it’s also less decentralized than other platforms, with only 21 block producers. You can find the EOS on several exchanges where it’s paired with other cryptocurrencies like BTC or ETH. Did you know it’s possible to get free cryptocurrency without mining? Click here to find out how. NEO is both a Blockchain platform and a cryptocurrency that aims to popularize the digitization and self-management of physical assets though smart contracts. Hailing from China, NEO is said to be a competitor of Ethereum. Originally known as AntShares, the project gathered a lot of attention in 2017 and was rebranded as NEO. In 2018, this cryptocurrency saw a significant growth and stands today at a price of $7.67. Some even expect the price to rise up to $200 by the end of 2019. Like Ethereum, Cardano is a smart contract platform and a currency. Described as third-generation Blockchain, Cardano was conceptualized with a scientific approach in mind and is built on peer-reviewed academic research that is aiming to solve security flaws encountered in other platforms. Cardano is designed to be scalable, interoperable, and sustainable. The cryptocurrency made available by that platform is called ADA, and the team working on it says that there will be a maximum of 45 billion ADA coins created. You can also use Daedalus, the open-source wallet created by the same team behind Cardano. While Cardano shows promise, it has yet to fully deliver on it, so stay updated about it in 2019 and beyond. If you want to make money trading Bitcoin, you should be present on Bitfinex. Founded in 2012, Bitfinex is the leading cryptocurrency trading platform. With Bitfinex, you can easily exchange cryptocurrencies for others, like BTC for ETH, as well as for U.S. dollars. You also have access to trading options, high liquidity, and dedicated support. That said, keep in mind that this trading platform is more for intermediate and advanced traders. Also, Bitfinex has discontinued its services for U.S. traders, so if you live there, you might as well look for other platforms. Coinbase is the first regulated Bitcoin exchange in the United States and the world’s fourth largest exchange in terms of USD volume. You can easily buy, sell, and store these cryptocurrencies: Bitcoin, Bitcoin Cash, Ethereum, Ethereum Classic, and Litecoin. There is also the “Coinbase Bundle,” which you can use to buy all five cryptocurrencies at once. It’s definitely one of the most secure and user-friendly platforms currently available. Coinbase supports 32 countries, though some transactions limits may apply depending on which country you operate from. Coinbase also offers its users the Coinbase Shift Card, a handy VISA debit card that they can use in some U.S. States and Territories to make purchase with Bitcoin in places that accept VISA. For beginner traders, Coinbase is a great platform for learning how to trade Bitcoin and other cryptocurrencies without feeling overwhelmed. There are a lot of great ways you can make money with Bitcoin this year. Click here to find out more. Kraken is another solid platform to trade Bitcoin. A popular choice among both traders and institutions, Kraken offers the option to trade with several fiat currencies including the U.S. dollar, the Euro, the British Pound, the Canadian Dollar, and even the Japanese Yen. It allows margin trading in many currency pairs, most notably ETH/XBT, ETH/USED, XBT/EUR, ETH/EUR, ETC/XBT, etc. Kraken also provides strong security and trading options. Note that there is a tier verification system that limits access features depending on the user’s current tier of verification. AvaTrade is a well-established Forex and cryptocurrency trading platform known for its high-end services. You can start trading with as little as $100, and will have access to all the leading cryptocurrencies in the market. Furthermore, there’s a large variety of funding methods, from debit cards and credits to PayPal, Moneybookers, and more. You also have access to leverage of up to 20:1, meaning you can buy or sell a given contract that amounts to a maximum value of 20 Bitcoins. While it presents a high risk, this feature also provides a high return if you are able to correctly predict where the market is going. And as you would expect from a popular trading platform, the customer support is great and available 24/7 in no less than 14 languages. If investing is your cup of tea, try investing in real estate. Sign up for Roofstock today! RunCPA is the first affiliate marketing network relying on cryptocurrencies. It works like a regular affiliate marketing platform, with advertisers and sellers, except that the money made by affiliates is paid in cryptocurrency. RunCPA’s catalog of affiliate programs includes cloud mining, casino and betting, trading tools, and more. Users of that network have praised the high payout and great support, though they wish there were more offers. If you don’t know much about affiliate marketing in general and would like a solid resource, check our review of the Making Sense of Affiliate Marketing course. BitBond adds a new possibility to the crypto world by allowing users to lend Bitcoin to others. Since 2013, investors can finance entrepreneurs and get returns in Bitcoin. Users of BitBond enjoy easy applications, fast approval and global access to lenders and borrowers. Whether you’re just starting out in the crypto scene or you’re an experienced trader, you should add TradingView to the list of websites you must consult regularly. When it comes to trading, regular or otherwise, information is crucial to making the right decisions at the right time. While TradingView is focused on regular stock markets like Nasdaq and S&P 500, it also features a section exclusively dedicated to cryptocurrencies. What TradingView provides is a large network for traders to create and share charts, as well exchange information and ideas on the state of the crypto world. You can easily check all the metrics and performances of every crypto asset, like closing price, total and available number of coins, traded volume, price change percentage, and more. Thus you can see the summarized market situation at any time, and take action accordingly. On top of accessing real-time information and market insights, this platform has an active community that is always discussing timely topics. Check out this list of investment apps that both experienced and beginner investors should use this year! As you probably already know know, it’s safer to move your crypto assets to your own crypto wallet, rather than leaving them stored within Bitcoin trading platforms. As you advance in your journey to trade Bitcoin and other cryptocurrencies, having a dedicated wallet for you assets becomes a must. One of the most popular crypto wallets around, Atomic Wallet offers an intuitive, user-friendly interface that keeps your crypto assets safe and secure and facilitates their management. Plus, it supports over 300 coins and tokens, so basically almost any cryptocurrency you might be interested in is covered. Other features include, among others, decentralized storage for private keys, the option to buy cryptocurrencies with your bank account, and Atomic Swaps, smart contracts that allow the exchange of one cryptocurrency with another without an intermediate like exchanges. Atomic Wallet is available on Windows, Mac and Linux; the mobile app can be installed and used on both iOS and Android. You can download and start using Atomic Wallet for free, but to use certain services, you will have to pay fees. While perhaps not the cheapest crypto wallet around, Atomic Wallet still provides massive value and a stellar experience. Ledger Nano S is a hardware wallet you can carry with you everywhere. It’s an offline device that can’t be hacked and is often used to secure large amounts. It supports over 40 cryptocurrencies and can run up to 18 device applications. In the case you lose your Ledger Nano S, a recovery phrase comprised of 24 words will immediately restore your account and assets on any Ledger device. The Ledger Nano S sells for €75 (around $98), and is the ultimate security solution for your coins and tokens. Long Game is a personal finance mobile app that rewards with fun and cash for saving money. Basically, the more money you save, the more coins you earn and which you can use to play games and earn extra money. If you are wondering how this app relates to cryptocurrencies, you should know that aside from cash, it can also reward you with crypto prizes. You can’t buy cryptocurrencies on Long Game, but you can transfer your prizes to your crypto wallet. While it’s not related to trading Bitcoin, you can accumulate a side of cryptocurrencies while you play games. Click here to get started with Long Game and win crypto prizes while having fun. A good rule of thumb in trading in general is to avoid investing more money than you can afford to lose. You should always be able to walk out without harsh consequences in the event of a complete loss. So never put money that would leave you in deep trouble if you were to lose it, because you can never be 100% safe from a loss. Also, don’t leave your money in an exchange, as doing so means you don’t have total control over it; you should always resort to a crypto wallet. Before you start trading Bitcoin, make sure you invest in your health! Sign up for HealthyWage today and start earning money by losing weight and getting fit. Don’t jump into the crypto world just because it’s trendy. You need to set clear profit goals and stop-losses before you trade Bitcoin. Don’t aim too high from the get-to, and don’t set stop-losses that are too low. Next, you should decide which cryptocurrency to buy, so make your research thoroughly and don’t buy a given cryptocurrency just because others are buying it. Lastly, take the time to look for patterns that yield you good returns, and repeat them while monitoring changes in the market. If you want to track your income and expenses, be sure to try the automatic financial tracker Hurdlr. Get started today. As all traders like to say: don’t put all of your eggs in one basket. Focusing your funding on one asset exposes you to the risks linked to that asset – you might win a lot, but also lose a lot. Investing in different assets will help you minimize losses and avoid getting too stressful about the state of one particular cryptocurrency. Chart reading is mandatory for identifying market trends. So be sure to learn all the terms related to Bitcoin trading: opening price, closing price, price direction, trending range, order book, stick candles, etc. Take the time to learn the linear and logarithmic Bitcoin chart, as they help you get a more comprehensive picture of the market and assess long-term trends. As a Bitcoin trader, you need to develop the ability to see patterns and make educated guesses about where the market is headed. Learn the two major analysis methods – fundamental and technical – to understand the market situation at a given time. Also, always stay informed on the latest news and events in the cryptocurrency world. Looking for more ways to earn extra money to support your Bitcoin trading efforts? Try renting out any unused real estate property you own by becoming an Airbnb host – click here to get started! Trading and psychology go hand-in-hand. Developing self-awareness of your personal bias (recency bias, anchoring, confirmation bias, etc.) will help you avoid many costly mistakes. Likewise, never act purely on strong emotions like fear or greed. Stay collected and keep a rational outlook on the market at all times to avoid making bad decisions. The cryptocurrency world too allows for the trading of futures contracts. In case you need a refresher on futures, they are agreements on selling and buying assets at a set price at some point in the future. Note that there are two positions with futures: short and long. Each of the parties involved can choose either a short or long position. Usually, the buyer goes for the short position to get the best price, while the seller opts for the long position, hoping for the price to go up. The main advantage with Bitcoin futures is to ensure protection from high fluctuation in prices and the volatility that ensues. Bitcoin futures are an efficient asset you can use to hedge the price of Bitcoin as it rises and falls. If you are looking for ways to make money that you can in turn invest in Bitcoin, try joining Avon as a rep.
As things stand, it’s safe to say that Bitcoin – and to a lesser extent, other cryptocurrencies as well – is here to stay. Cryptocurrencies will keep evolving and attracting more users in years to come. So be sure to reinforce your understanding of the Bitcoin world’s workings, and keep a keen eye on how it evolves. This way, you will develop the ability to detect market signals in a timely manner and react accordingly to maximize your profit. Looking for even more tips and suggestions on how to make more money? Check out our comprehensive list here! What cryptocurrencies are you already trading? Which ones show good potential according to you? Let us know in a comment below!